On an ordinary Berkeley street just off Shattuck Avenue, in a typical lower-level studio, a unique artist works carefully, and with great focus. 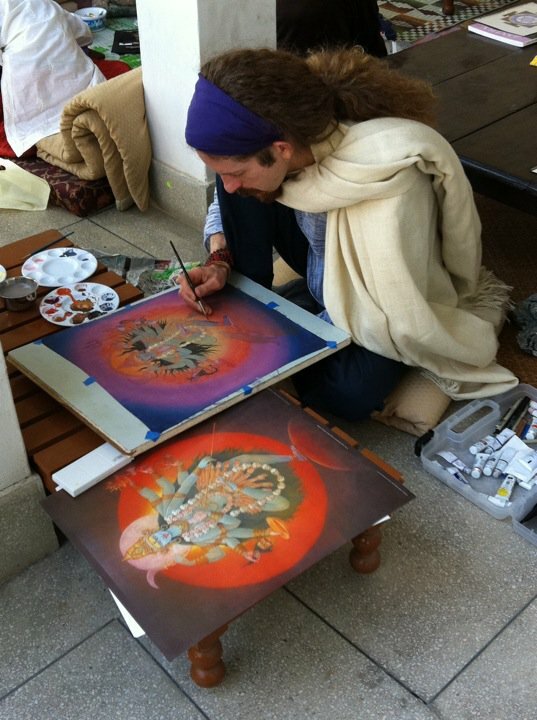 What is not so ordinary however, is that the artist is also a student and teacher of Classical Tantric Hatha Yoga, and his studio produces sacred art and images for meditation. Enter the studio of Ekabhumi Ellik, and you will step into the realm of a tangible and ancient spiritual practice and discover a complex and beautiful artform that is integral to the practice of tantra. How is this kind of traditional sacred art developing within our contemporary western culture? Is this an artform we can appreciate even if we don’t share the faith, or can we best understand it as sacred craft? How do Ekabhumi and his assistants keep their hands steady when painting all those freehand lines? Still so many questions. Like many artists Ekabhumi’s creative journey has been an unpredictable one. He went to art school in SoCal but became frustrated with the gallery system and wanted to follow a different path, one that would lead him away from visual art completely, into a twenty year career as a poet, emcee and organizer of poetry competitions, as well as a teacher and coach for poets of all ages. He returned to making art with his hands again in 2010. While this work uses the wide visual vocabulary of several traditions, he and his associates specialize in Tantric Hatha symbolism. The imagery one usually sees of deities such as Kali and Lakshmi often date from the stylistic dictates of much earlier times, with goddesses dressed in the royal garb of a particular kingdom. The challenge for a sacred artist today is to capture and embody the same essence and original meaning of the image but try and modernize a little for western practitioners. Updated depictions of deities such as Ganesh, Lakshmi or Kali have more humanoid physiques for instance. Though the visual differences from earlier times are subtle they are quite significant because, as with any religious or faith system, the visual stories they use carry a meta meaning, more than a sacred text can convey. A book release for spring carries illustrations by Ekabhumi in Awakening Shakti, The Transformative Power of The Goddesses of Yoga, a book by Sally Kempton from Sounds True Press. While tantra refers to certain religious rituals and meditation practices that have influenced Hindu, Sikh and Buddhist traditions since at least the 5th century, of itself however, it is not a distinct religion. 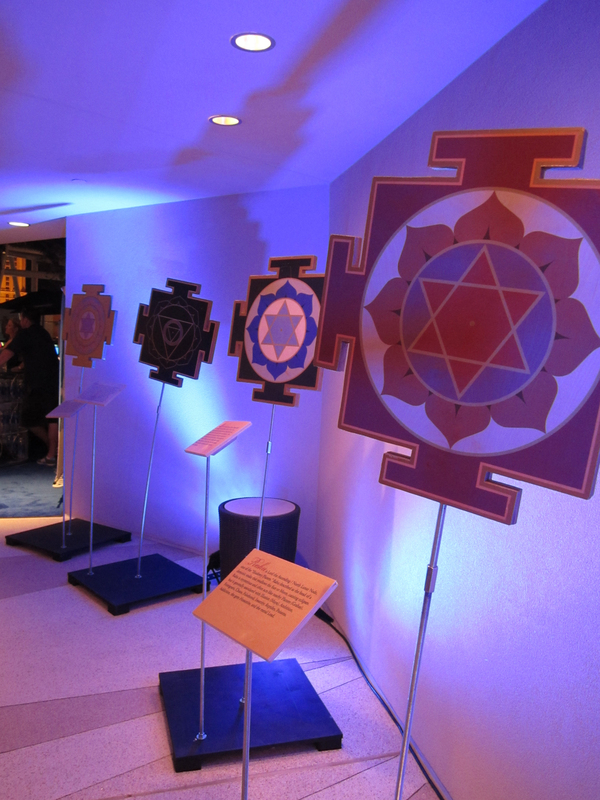 Tantra involves the use of the mantra, phrases repeated while meditating, and the yantra which is a physical and symbolic tool for meditation focus. 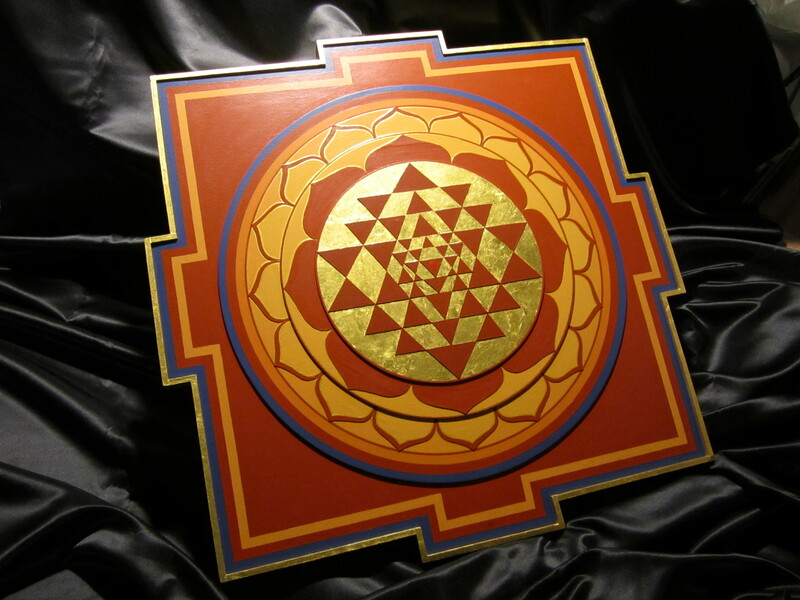 Each geometrical element of a yantra has a specific meaning and the composition of the overall design may follow traditional configurations for deities or vedic astrological planets. I find it fascinating that the elements of yantra grammar relate very closely to the symbolism of other systems of visual language. Architectural yantras for instance may be used as the ground plan for temples and within this plan, basic geometrical elements have specific meanings and can be ‘dynamic’ or ‘static’. Ekabhumi’s studio produces large colorful yantras, beautifully painted on wood completely by hand, and built up in layers so that the object has a clear physicality. All are created with the same kind of spiritual devotion and ritual preparation that are an essential part of their purpose and meaning. The pace of creation has to be slow, the intention clear and the mind focused in order to produce perfect lines and curves by hand. I wonder what kind of art we would all create if meditation were to become standard artistic practice. If you need to know more, Wikipedia has some great information about tantric traditions and history and you can contact Ekabhumi directly here. For information on his yoga classes at the Yoga Tree on Shattuck Avenue in Berkeley, visit the main Yoga Tree website. This entry was posted in South Berkeley Artists and tagged Art journal, Berkeley, California, East Bay, Ekabhumi Ellik, open studio, sacred art, South Berkeley Artists, yantra. Bookmark the permalink. Great stuff – can’t wait to see your interview with him. Perhaps you could remind everyone that this is part of an in-depth series on South Berkeley artists? Many thanks codaprojects. You’re right about mentioning the series but I’m not quite sure how to do it within the blog format. Oh wooooow these are sooo beautiful !!!!! Agreed. They are amazing and I found myself just wanting to stare and stare while in his studio.